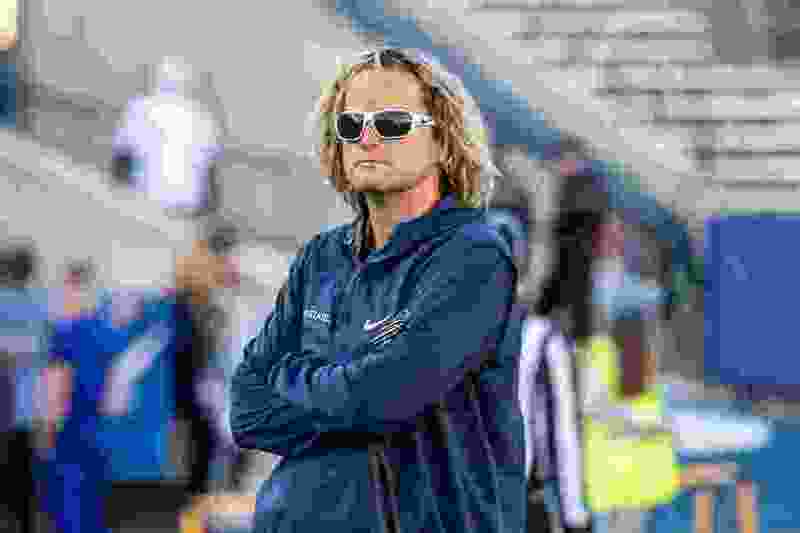 Utah State OC David Yost has turned the Aggies into an offensive juggernaut. This is how he did it. (Photo courtesy of USU athletics) Offensive coordinator David Yost, shown here prior to a game earlier this season, has the Aggie offense clicking at an impressive rate. Halfway through the year, USU is averaging over 51 points per game. Logan • The brains behind one of the highest-functioning offenses in the country takes a swig from his giant gas station styrofoam soda cup directly in front of his keyboard. Surrounding him on this end of his elongated desk are mounds of papers riddled with plays. On the whiteboard behind him? A gluttony of schemes and outlined plays. On the projector screen near the end of the table? Yep. More plays. A Microsoft Word doc is being pieced together ahead of Utah State’s road trip to Laramie, Wyo., this weekend. David Yost is multitasking. With reading glasses falling further down his nose, with his black Oakley shades nearly lost in his signature blonde surfer bro mane, Yost is asked why his job is so fun, so easy these days. The question is posed often lately. That’s what happens when your team averages 51.7 points per game, second-most in the country, second only to the sport’s juggernaut, Alabama, by 1.9 points per outing. The plays, though, are part of Yost’s methodology, which is motoring along and operating at a backbreaking pace. That is, if you’re the opposition. The Aggies are making teams huff and puff, and well, that’s just the beginning. 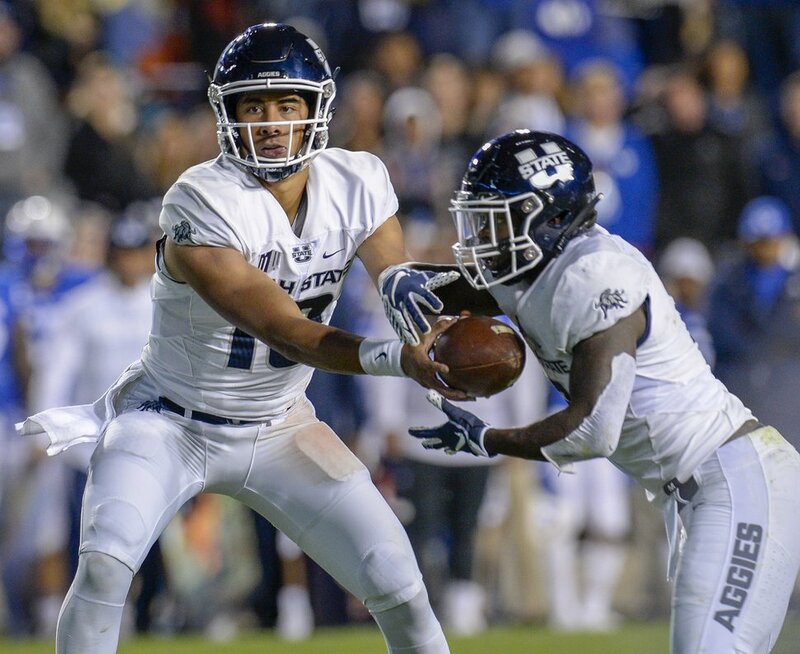 USU’s offense is running teams off the field, burning up the scoreboard and looking every bit the damn-difficult-to-scout attack Yost imagined when he got to Logan in 2017. The Aggies have scored 42 points or more in their last five games. Prior to this, they’d never had 40-plus performances in more than three straight games. Ever. These Aggies are 5-1 for the first time since 1978, their lone loss of the year coming in East Lansing, Mich., against the Michigan State Spartans by just a touchdown. The team that just beat Penn State in Happy Valley. Unbeaten in conference play, they have a manageable runway ahead of them in the Mountain West. Boise State in late November will be the measuring stick, because it always is. But in less than two years, USU’s offensive coordinator has helped revitalize football in Logan. And he’s done it, he said, by being an effective pirate. “Coaching is plagiarism,” Yost says. Ideas are rarely original in the business, he adds. It’s about what works, how you think you can tinker with it, and how you might make it your own. The Aggies aren’t doing anything revolutionary. On the contrary. They’re just benefitting from an offensive mind schooled under several other great minds. The offense’s base philosophy, he said, comes from his time at Missouri, where under Gary Pinkel and alongside Dave Christensen, he learned how to perfect the spread-option offense. Passing game concepts? Primarily from the time he spent working under Mike Leach at Washington State. The Aggies always want to try to attack teams vertically first. Then, there’s the speed. That comes from — where else? — Oregon, where he learned that if timing is dialed in, if plays are prepped, if the game-plan is chugging along, tempo is a secret weapon that can wilt the will of any defense. The unrelenting up-tempo approach USU has enacted, mixed with the run-game schemes, is derived from Yost’s time with former Ducks coach and offensive coordinator Mark Helfrich. In more than one game so far this year, conversations between players on the field have eventually filtered their way to Yost. “Why do you guys go so fast? How do you guys go so fast?” are commonplace to the Aggies as their offense goes and goes. “I think our kids kind of take pride in the other team doesn’t like it,”Yost explains. Go fast, keep it simple, and let it fly. Sophomore quarterback Jordan Love’s stellar start is largely based on his grasp of what he needs to do. Take downfield shots as much as possible. Let your best weapons go up and get the ball. When you have players who can go deep, who can rise up and win 50-50 balls, that only makes Yost’s calls easier. On passing attempts longer than 20 yards, Love has 11 completions and seven touchdowns with a passer rating of 90.7. It helps, too, that the Aggies might be deeper than they’ve ever been at various skill positions. It takes Yost nearly a minute to list off every key contributor while at his desk in his office. Jalen Greene, Ron’quavion Tarver, Aaron Vaughns, Dax Raymond, Jordan Nathan, Darwin Thompson, Gerold Bright, those are just the first names listed as to why it’s all clicking. That, and of course, Love, who has 1,557 yards passing, 14 touchdowns and an overall passer rating of 159.1. Then he rattles off the five returning starters on the offensive line. And his peers. It’s not just him and his room full of charted plays. It’s everyone having bought into what he said could work. Put it in play, throw it to the best players. Against the Cougars, the Aggies mixed it up. And ran for 223 yards. In the rout over UNLV, Yost brags not about how the offense had 42 points at halftime. He brags about Love having the wherewithal to notice twice that UNLV jumped offside and a free play was available and the 6-foot-4 sophomore uncorked a couple deep balls, each resorting in touchdowns. When the ball was snapped, Yost said, he’d yet to get the play call into Love. USU head coach Matt Wells says, predictably, that coaches aren’t naturally patient people. But given how seamlessly Yost’s schemes have taken root in the program, he credits the recruiting of players brought to Logan to fit what the Aggies are now known for, and the development of players already here to adjust accordingly to what’s asked of them. Even at 51.7 points per game, Wells doesn’t crack too wide a smile. “It’s not about stats,” he said. “It’s about putting together the best offense we can to be very efficient, very unique, but explosive and give our team and our program the best chance to win." What they’re doing is rolling, in control of their own destiny in the MWC, and if the points continue to pile up, a soon-to-be national ranking and more eyeballs tuning into what Yost has cooked up every weekend. Those inside the building say he’s a unique dude. The hair is indicative of his team’s style: daring and different. That, and well, the numbers don’t lie. The path to Logan » Prior to being hired at USU in Feb. 2017, Yost was the passing game coordinator/QB coach at Oregon (2016), inside WRs coach at Wazzu (2013-15) and offensive coordinator at Missouri (2009-12). Year 2 is clicking » The Aggies are averaging 51.7 points per game in their 5-1 start, the second-most in the country behind only No. 1-ranked Alabama. Go, go, go » QB Jordan Love has 1,557 passing yards and 14 touchdowns to go with a passer rating of 159.1. Running backs Darwin Thompson (56 carries, 426 yards, 7 touchdowns) and Gerold Bright (65 carries, 421 yards, 4 touchdowns) are pushing the ground game. And USU has eight WR’s with at least a 100 receiving yards this year.